I keep having holidays jump out at me from behind my calendar. Know what I mean? One day I look and the holiday is three weeks off and then it seems like it's just the next day and I am sitting at my desk minding my own business making a birthday card and talking about skin care with my hamster and BOOO out from the wall the calendar yells, "MOTHER'S DAY IS SUNDAY!" I jumped a foot! That's here in the USA, of course. I know some of you were already startled by that holiday a few weeks back. For you, however, you must have something coming up like Boxer Day or Bra Day or some such Unnerwear Day. Speaking of unnerwear, all of the holidays creep up on my any more. I figure what we could do is, we could just all agree to stop time, say on the 15th of this month, for about ten days while we do nothing but make cards for special holidays. Are you with me? Okay, good. I'll start a petition. Some of you may remember that I bought a bunch of beautiful napkins when I went to see my friend in Colorado last fall and every now and then I will dip in the napkin basket and use one to make a card. They are truly gorgeous napkins. To dimensionalize my nappy, I added a hydrangea that I made by applying some Tim Holtz alcohol inks and blending solution to a piece of glossy card stock (ala Laurie), stamping the hydrangea and then fussy-cutting it. To make it look like it was an inter grill part of the napkin, I added the stem and bud after fussy-cutting them from another snippet of the napkin. The sediment banner is made from a snippet of purple vellum, certainly celery cardstock, and an overlay of clear vellum. The flower centers were popped on with Liquid Pearls. And thassit! Clean and Simple 291, sketch. Pixie's Snippets Playground, use your snippets. The Squirrel and the Fox, "Mother's Day." This is my first time playing in this challenge! You might have guessed that Hammy found it when he was leafing through the magazine section of the Sunday Critter Chronicles. Words 2 Scrap By, "Bloom Where You Are Planted." If you click on the challenge links, you will find all the details about rules, sponsors, and prizes! I'm so thrilled to introduce you to our newest friend at the Playhouse. Please welcome Jenny B. of Owl Be Crafty! In Jenny's own words, she enjoys doing just about anything creative such as baking, event planning, and photography, but her absolute favorite thing is making cards. Everything she learned about crafting, she learned from her mother! What a wonderful acknowledgment from a sweet daughter and so timely as we celebrate Mother's Day! Jenny is trying to become more active as a blogger and I know that your visit and your encouragement will mean a lot to her. If you could follow her, that would be an added bonus for both of you! I know you will find her card art to be exceptional and inspirational! Welcome, Jenny, and thank you for joining us!! I have made a collage of photos for you as a follow-up to my last post. If you're interested, the individual photos can be viewed by clicking on the tab at the top called "My Photos." OW she will love the card its absolutely stunning!!! Hi Darnell this is such a beautiful card....love the colours and stunning stamped image. Stunning card. 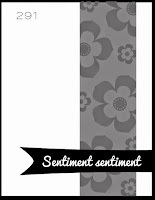 Like the idea of extra dimension with the stamped flower. I'll sign your petition to stop time - great idea. I think I am speechless..... your card is incredible, I love what you did with the alcohol inks and that hydrangea - stunning and yes it does look inter grill with the rest of the card! Wowzers! Gorgeous, gorgeous, gorgeous! Spookily, I'm featuring a similar flower in white. Pass the petition over here. Looking forward to Thong Day! Oh my goodness. Your DIL is going to love this Darnell. The hydrangeas are amazing! Gorgeous card Darnell! The flowers are real beauties! Put my name on the petition ... I'm with you! Oh my what a stunner this card is .... DIL will LOVE this! And I love looking at photos ... gotta love those chickens! Absolutely stunning card! What more can I say? I fall for every single purple hydrangea that crosses my path, and this is no exception. Beautiful napkin, gorgeous alcohol inked bloom that you created. Thanks for joining us this month at STAMPlorations! This is one gorgeous card for a lucky Mom! WOW! I love the darker hydrangea against the softness of the napkin! BEE-YOO-TEA-FULL!! I love your card and so will your DIL. Hydrangeas are one of my favorite flowers and remind me of my youth in Oregon. Where did you go on your trip? Happy Mothers Day. I just viewed the photos which is difficult on an IPhone and Darnell you are very gifted. Each looks like it should be in a frame. This is gorgeous. Your DIL is going to love this one. The stamped image is so pretty and love your design! That is one absolutely fabulous card Darnell - I can almost smell the flowers right here - atchoooooo, sniff, snuffle! I can see there was a shed load of work and love went into it - beautiful colouring and the vellum sentiment is just such a perfect finishing touch too! Hope you had a lovely day. Wow! Darnell, this is a stunning card and your daughter-in-law may become breathless when she sees it. I think I would. Your photos are gorgeous...such beautiful flowers, body of water, and cute critters/animals. Thanks for sharing them. I only have DIL to make Mother's day cards for too, just the chain of life. Wow, love everything about this card Darnell! The colour is beautiful and the way you've used the napkin and the dimensional hydrangea is wonderful. So creative of you to use the napkin on your card! I just love hydrangeas and your card is beautiful!!! Beautifully done - that napkin is just wonderful and I understand why you bought them! 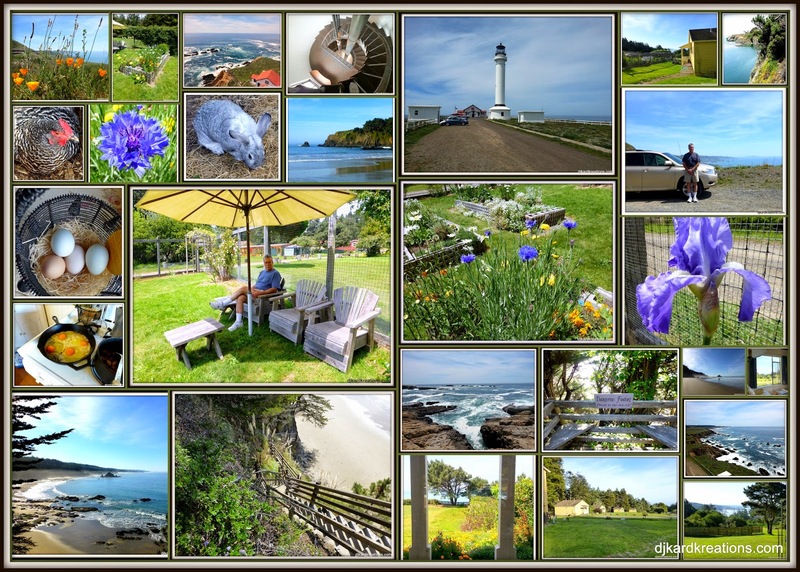 Great pictures or collage of the coast! Stunning! The colors are so dynamic!! She will love it. Happy Mother's Day to you, Darnell. Where is that petition?! I'll sign it. Can we add a rider there will be no health issues allowed during those 10 days we are using to make cards? I mean, we won't have time to them and all. Great pretty card! I remember using napkins on cards, but more for making some fancy schmancy envelopes out of it. Gorgeous colours and gorgeous card. Enjoy your brunch. This card is a keepsake! One of my all-time favorites, Darnell! Lovely collage--thanks for sharing! I like how you incorporated the image with this paper napkin background! You've done a great job fussy cutting the image and I like how you popped it up too. Very elegant! You are really going to score in the MIL department when you give this STUNNING card to your DIL!!! LOVE it Darnel! An outstandingly beautiful card with those pretty hydrangeas. Like you, I made cards for my daughters and daughter-in-law as my mom and hubby's are in Heaven now. Love your hydrangea card, and I love your stunning photos! Beautiful card! Your DIL is going to love it. Your card is BEAUTIFUL!! LOOOOVVVVEEE IIITTTTT! Not only is the napkin gorgeous, but your stamped hydrangea goes so perfectly! Your DIL will feel the love! Happy Mother's Day! I love seeing "re-purposed" items on cards! Inspiration comes form all kinds of interesting places. Love the hydrangea card, I bet it feels wonderful, too! Thanks for playing along with us this month at Words2ScrapBy.blogspot.com. Ha, those holidays do the exact same thing to me! I'll sign that petition immediately! Beautiful card! That alcohol background is stunning! Ooooh - that is just so GORGEOUS !!! Fantastic colours on there and that napkin is amazing. You did a beautiful job with the inks and stamp :-D FABULOUS. The hydrangea card is magnificent! Seriously...a napkins? Your dimensional hydrangea is gorgeous! The colors blend together beautifully! And your fussy cutting - wow - barbers everywhere would be impressed! Fabulous photos! The lighthouse staircase pic really needs to be enlarged and framed! Real pigeons or fake? Seals in the water? I kept getting comments on my blog about you sending people over to my site and I thought WOW what amazing word of mouth she has! Then I popped over here and starting reading through more posts and realized you spotlighted me. I had missed that the first time, lol! I can't thank you enough for your awesome introduction of my little blog :) I was so surprised and honored! I truly appreciate your support and hopefully this will continue to help me build up my little crafting world. Again, no words how grateful I am! Napkins?? How do you come up with these wonderful ideas??!!! I would never have thought to use napkins but have certainly seen some gorgeous ones in my travels. I love hydrangea's and have quite a few in my garden. Unfortunately we are going into winter so they don't look their best but wish I had one this colour to look forward to in Summer! Never in my wildest imagination would I have thought of using a napkin. What an amazing card! I'm sure your DIL loved it and will treasure this work of heart for a long time to come. Thanks so much for joining us at W2SB! I absolutely love your hydrangea card and want to try the alcohol inks in the way you used them. Now I gotta go buy more alcohol ink. Thanks a lot, Darnell! (says she, sarcastically) LOL! Wow, what a great card. DIL will love it. Love that you incorporated the napkin and the paper. You always have the best ideas. WOW, Darnell, this is just beautiful!!!! Your DIL surely loved this card as much as I do!! Here in SA we are having MD on Sunday, so hopefully I will be spoiled with coffee in bed! Hope you had a lovely MD!! How elegant and royal too! Love the design, beautiful colors and how you mounted your beautifully painted creation! What a beautiful card, Darnell! I love the colors and the layout you have chosen works perfectly with your napkin art. So feminine! Thanks for joining us at STAMPlorations! Love this, Darnell! I have never tried the napkin technique, but I sure am going to try it soon! All I can say is WOW! I love what you did with the napkin and the alcohol inks! They are my favorite medium, thanks for sharing! Hi there miss awesomeness!!! Congrats on your top pick at Stamplorations!!!! This is so magnificent, my moms fave colors too sigh!!!!... Love!!! Congrats on your top 3 pick over at STAMPlorations, too! A beautiful card! Nice to see our two cards sitting there together. :-). Hugs!